My office replaced a swimming pool. 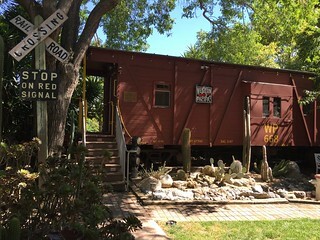 WP668 is the 100-year-old railroad caboose in San Jose, California (“the Capital of the Silicon Valley“) where I work for Mentoring Standard. Above is WP668 in our backyard now, and below is what the same space looked like in the year 2000. 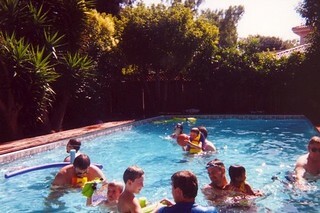 The swimming pool was removed ten years ago – see more photos on the WP668 webpage. 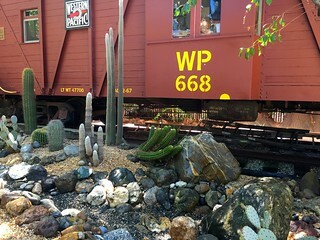 I designed the landscape setting for WP668 based on large rocks and cactuses, including a Y-shaped arroyo (or dry creek) that is small enough to be called an arroyito. 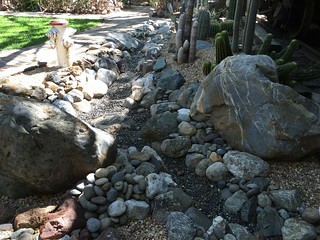 Like the bones of California, our arroyito is largely made up of granite, basalt, limestone, and quartz, with jasper, serpentine, sandstone, conglomerates, and other stones for variety. 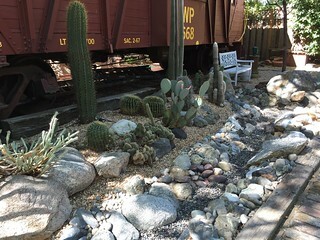 We bought two large boulders from South Bay Materials but the other rocks were adopted as individuals. 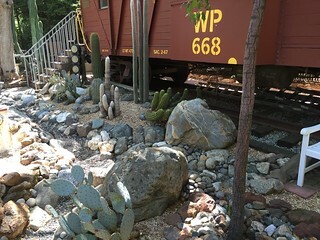 Every time we go on vacation or a road trip, we come home with new garden rocks, so the arroyito becomes more solid and complex year-by-year. My family complains when they have to ride home from a trip with their feet on top of the latest stones headed for the arroyito but they still help me stuff rocks into the car.